I'm due in 6 days, so I thought I'd better post something before the big day! It's been a crazy and fun couple of weeks. 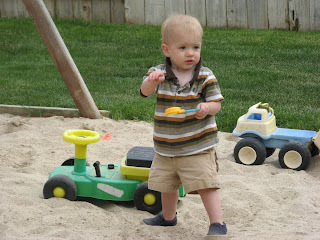 I'll post some cute pictures of Cash and his cousins, and Cash and his buddy, Oliver. Ryan and I are both super busy and it seems like we don't get to spend time with each other anymore! But, we do get to spend time with Cash, each individually. :) He's such an amazing little boy! He learns more things every day and I love his sweet face. I just took him to the doc, and he finally weighs 20 lbs! Actually, 20 lbs 1o oz. Other than that, not much big happening. Except Cash does have a new little cousin, Ezra... Ryan's sister, Rebecca had her baby! He's pretty cute!! Okay, I'm out -- Cash is already up! Okay, so I finally just set the timer and took a picture of myself. I must say, that did make me feel dumb. Anyway, you will all now believe me when I say that my belly is VERY LARGE and uncomfortable. 22 days from today is my due date! You all need to pray that she either comes before then, or after the 7th because my doctor is leaving out of town... and if it weren't for him, Cash wouldn't be here, so I'd really like for him to deliver our little girl. The pictures of Cash my mom took in her backyard. 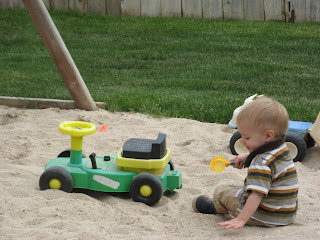 He LOVES the sand box and played out there all day. She said he especially loved the throw it up in the air and have it land on his head. He loves the dirt! Okay, so I'm a terrible wife, and not only did I not take any pictures of our anniversary, I'm not posting this until 3 weeks later! Our anniversary was May 22. 4 YEARS!! It's pretty unbelievable how you can love someone more each day, even though you thought you loved them as much as you could. Ryan is an amazing husband and does so much for me as a wife, mother and friend. I actually went out of town on our anniversary (how nice of me, huh!) to Utah for some training for my job. It was strange being alone in a hotel room. I got back the next night and I was going to have Heather take me home because she was picking up Debbie (my mom-in-law) from the airport as well. Ryan's the best and surprised me and had a babysitter and took me out for the night. He's pretty thoughtful! Since that day I'm not sure what's happened. Ryan and I have been so busy with both our jobs, and Cash is growing and changing and talking more and more each day. My favorite thing he says is: Thank you! It's so cute. Along with: hot, out, Max, dog, baaa (for sheep), he whistles, uh-oh, dad, mom (sometimes, if he's sad), and a lot of other stuff. He'll try to repeat anything you ask him to. He's pretty special. Oh, we did have a "staycation" on Memorial Day weekend. We fully set up our tent in the backyard and slept outside. I've got to say, it was the best sleep I've had since the belly emerged! Cash went in at about 4 in the am, but it was still a lot of fun and fully worth it! I hope all is well with everyone... I'll post some fun pictures soon. (Once I TAKE some fun pictures). We love you all! A glimpse into the lives of Ryan, Mary, Cash, Marley and Halle.